HR McMaster: Why did Trump dump national security adviser? Image caption McMaster has been labelled the world's "pre-eminent warrior-thinker"
US President Donald Trump has replaced his National Security Adviser Herbert Raymond McMaster after just over a year on the job, replacing him with Bush-era war hawk John Bolton. General McMaster's character had reportedly rubbed members of the Trump administration the wrong way. Mr Trump had referred to the army lieutenant general's briefings as "gruff and condescending", a source told CNN. He was also described as "aggressive" and prone to lecture. Politico reports that Mr Trump once interrupted him during a lengthy briefing to say: "Look at this guy, he's so serious!" The Washington Post said the two had never personally "gelled". Mr Trump publicly criticised his national security adviser on Twitter in February after Gen McMaster told a forum in Germany it was "incontrovertible" that Russians had meddled in the 2016 presidential election. "General McMaster forgot to say that the results of the 2016 election were not impacted or changed by the Russians and that the only Collusion was between Russia and Crooked H, the DNC and the Dems," a clearly peeved Mr Trump tweeted. It was reported last year that President Trump had also grumbled about Gen McMaster's plan to deploy more forces to America's longest war. "He wants to send more troops to Afghanistan, so we're going to send him," Mr Trump was quoted as saying. The president nevertheless ultimately approved the deployment of thousands more troops that August. Mr Trump reportedly floated the idea of actually assigning Gen McMaster to take over as commander in Afghanistan, and give him a top-ranking fourth star. Gen McMaster replaced Lt Gen Michael Flynn, who was fired after less than a month in the job for misleading the White House about his contacts with the Russian ambassador. 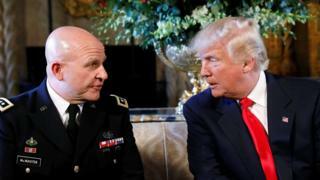 As a decorated war hero who had served in command roles in Iraq and Afghanistan, Gen McMaster seemed like the ideal candidate to counsel the commander-in-chief. Time magazine lauded him in 2014 as possibly "the 21st Century Army's pre-eminent warrior-thinker". But given that Gen McMaster's 1997 PhD dissertation in history argued that military top brass should have stood up to the president during the Vietnam War, he was never likely to be a wallflower in the Oval Office. Gen McMaster was said to be forthright in arguing that President Trump should not scrap the Obama-era nuclear agreement with Iran. The national security adviser struck a hawkish tone on North Korea, suggesting the US should not put up with the country having nuclear arms. "We can't tolerate that risk," he told CBS. As soon as he was appointed, Gen McMaster set about purging acolytes of his predecessor from his team. The counter-insurgency expert also found himself in a battle of attrition against White House chief strategist Steve Bannon. Mr Bannon's reported efforts to oust Gen McMaster backfired when he himself was shown the door. But the national security adviser's victory was short-lived and now he, too, has been jettisoned.